Posted in: Uncategorized. Tagged: analytics, VIX, Vix futures, Volatility, VXX. One might imagine that volatility would be somewhat elevated, especially now that we are entering a period where fiscal cliff political rhetoric and grandstanding could threaten market performance. In an investment world where the calendar means so much, skittish managers are caught between chasing the S&P 500’s out-performance versus closing out positions for the year, locking in gains against potential tax increases, shedding losers, and window dressing. Today the algos hit the tape on Senator Reid’s comments, just a daily example of the headline-programmed high frequency traders moving the market. And with hedge funds getting badly beaten by the S&P, this is creating a very difficult situation, in a time period when the market performs quite well historically. December is the #1 S&P 500 month since 1950 for performance and #2 on the Dow and Nasdaq. So what do you do, invest client funds just to watch them crater whenever the circus in Washington decides to put personal objectives ahead of the U.S. economy? Just in time for those statements to get printed. The spread between the December VIX futures and the VIX is only 1.4%, and the VXX short-term futures ETN has just rolled to hold all Decembers a few days ago. Therefore, a spike in the VIX will translate to a highly correlated spike in the VXX. This is fairly rare, since there are usually multiple buffers to prevent this type of action. Only for a short time period will the fund hold a vast majority of near month futures, and rarely with this much time until expiration will the VIX/VIX futures spread be this tight. The VIX options represent expectations of the forward value of the VIX; that is essentially what the VIX futures represent. For 12% you get an at the money hedge against the VIX. For 6.6%, you get almost the same hedge. The negative roll yield is -.5% per day, so that should be factored into the trade. Yet, you will get a better response on short-term spikes with the VXX. Today exemplified this mispricing as the VIX $15 strike option traded 16% higher and the VXX $30 strike option moved 26%. The VIX index rose only 2.7%. This result makes perfect sense considering the price inequity. Believe it or not, this is usually the reverse of the typical VIX/VXX arbitrage trade setup where you get long VIX options and watch the short VXX options decay due to the normal yield and spread scenario. Follow us on Twitter and Stocktwits @VolatilityWiz, and visit our website for trading ideas at VolatilityAnalytics.com. We have proprietary strategies for both institutional and retail investors. Data courtesy of the CBOE. We closed our long Dec $30 put position today in VXX, as the risk of an upside move in volatility was greater than the downside in roll yield from the VIX futures. We considered selling weeklies at .58, but that risk was greater due to the limited downside. We will look to re-enter on any significant VIX spike, but at this point, the January puts would be more attractive. For most of the month of November, the negative roll yield on the VXX was fairly low, frequently in the 4-5% range. 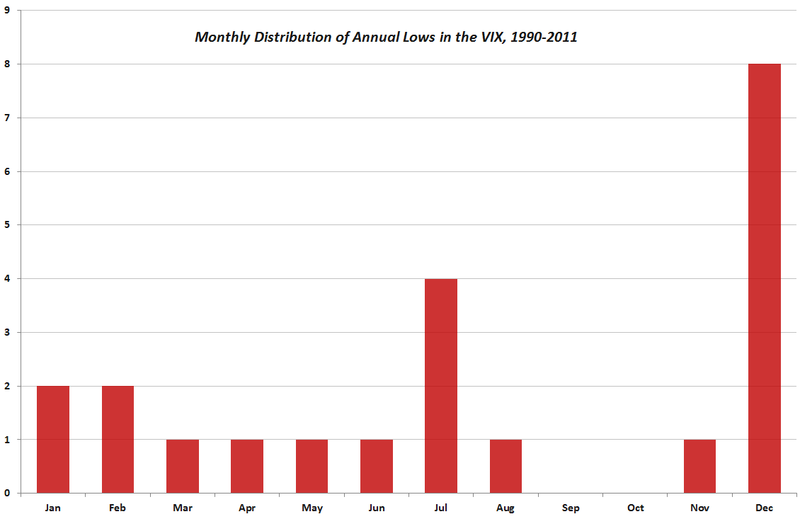 The reason for this primarily rests with the month of December, and the inherent seasonality of the VIX. The holiday market closures (extra decay when stocks sit idle) and seasonality of the equity markets have huge December and January VIX effects. The S&P’s top performing month since 1950 is December, and it is also #2 for the Dow Jones Industrial Average. As slowly rising markets are inversely correlated with a rise in the VIX, the options market anticipates lower volatility, and investors are unwilling to pay a high price for S&P options. 2.05/16.60= 12.3%. This essentially means that the VXX will fall by .123 / 23 x $31.7 = .17/day, every day, all prices remaining stagnant. If the January and December futures fall closer to a spot VIX of 15.2, then there will be additional decay to the ETN. As the VIX falls below 15, a better option for hedging volatility is the VIX options, as they do not carry the headwinds of the VXX. In fact, deep in the money VIX options look attractive when the VIX hits yearly lows, as they have less extrinsic value and offer quick returns in the case of market sell-offs due to ineptitude in Washington. The VIX term structure reflects the VIX formula at future points in time. 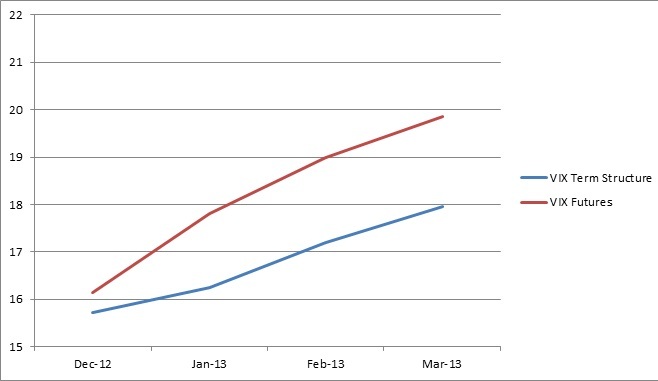 Essentially, the S&P options in the months out on the curve are the data points for the VIX structure. Just like the VIX, the midpoint of the bid/ask spreads are weighted by their distance from the S&P index’s current value. The implied volatilities are calculated to arrive at a VIX measurement for that point in time. The other term structure reflects the VIX futures pricing. These are the contracts priced on anticipated VIX levels at points in the future. Clearly, these two measures of volatility do not agree, as the actual S&P options have an implied volatility that is lower than the futures pricing. It is almost as if the futures have an additional layer of time decay, above and beyond the extrinsic value of the S&P options. It is critical to understand this if you are investing in VIX futures based exchange traded products. As the time to the contract moves to the spot price, or today’s VIX level, the two values converge. The November VIX futures, which expire at the close Tuesday, are in lock-step with the actual VIX. Yet the December futures are 8.5% higher than the spot VIX. January diverges from spot by over 12%. Apple shares did little today, but the Apple VIX made a significant move, and that was to the downside. VXAPL, the ticker for Apple VIX, fell 10.2% to 32.71. During the last several weeks as the sell-off in Apple shares picked up steam, the CBOE’s index of Apple volatility rose from 25 in early September, to over 44 in late October as the puts on Apple were bid high and skew developed in puts versus calls. The only higher measure was 48 in April, when Apple topped and began a $640 to $530 correction that lasted about six weeks. Since VXAPL was created by the CBOE as a measure of Apple volatility structured similar to the VIX formula, the historical average is 32.52, almost precisely today’s close. In 2012, VXAPL has averaged 31.82. By either measure, it is apparent that Apple volatility has mean reverted. 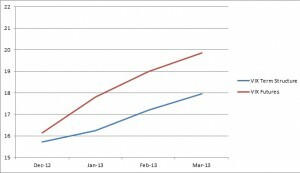 This may indicate the steep sell-off in AAPL is nearly through. The CBOE has filed with the SEC for options on the Apple VIX, similar to options on the VIX, as well as for several other stocks and ETF’s, like ones holding gold and oil. VIX and VXX Fall as the Markets Fall? Confused? People associate falling markets with a rising VIX and as a pure correlation, VXX rising. Not only is the rising VIX not perfectly correlated with a falling market, but the VIX rising is not a pure correlation to a rising VXX. This is where it pays to know how all of these indices and exchange traded products are constructed. The VIX is heavily weighted toward the December S&P index options, and after tomorrow, it will roll into January as the next-term option structure. The VIX does this one week before index option expiration, so as to avoid unusual OPEX fluctuations. Next week, the VIF, or the VIX far month representing the January options, will have a negative weighting in the VIX. I.E. the VIX will weight December at 1.25 and January at -.25. December has very low seasonal volatility tendencies. So next week, and essentially today in fact with one day to roll the index options for VIX calculation, the VIX is overweight December volatility. December and January options price in a lot of time decay due to the holiday season market closures, as well as seasonal equity trends during the holiday season. No matter how you view the fiscal cliff, or the long-standing ineptitude of government leaders, the markets will do what they do. And it’s telling you something during this sell-off. The options market is not expressing high anxiety relative to the degree of selling that we’ve witnessed since September, and intensifying this week. Part of this is due to seasonal factors, but part of it is also probably due to historic low interest rates, monetary policy, and decent U.S. economic fundamentals. Where else can you go to get a return above 1%? There are plenty of stocks with yields much higher than that while generating solid cash flow fundamentals. So the negative roll is now 4%, and you can see why the exchange traded products on the VIX were not up today. What can change this? If the market sells off significantly below the 200 sma, then the VIX could rise significantly. But at this point, we have seen a 6.6% correction over 37 days, the 4th longest correction since May of 2009. It is also the 4th deepest correction in two years. So, until the VIX crosses above 20, there is not a lot of downside fear in the options market. Posted in: Uncategorized. Tagged: analytics, election, futures, VIX, Volatility, VXX. VIX data goes back to 1990, so we have five presidential elections to weigh the behavior of uncertainty and therefore VIX levels. What could the election mean to the performance of volatility shortly afterward? In two of the five elections, the market was in a major downward correction. In 2008, the S&P was en route from 1400 to 666. VIX levels were extreme as the market gyrated by hundreds of points per day. In 2000, the internet bubble was coming to an end, and VIX levels were also quite high as the S&P was making a 400 point correction. Since we are not in a market similar to that, I am going to exclude those years as outliers. 1992, 1996 and 2004 are the few, but enlightening data points. The average VIX move by Friday of election week was -13%. By midweek the following week, the average VIX move was -20%, the starting point being the Monday of election week, essentially 10 days. Could there be extra anxiety this year due to the perceived closeness of the race? In 1992 and 1996, the VIX went from 17 to 13 and 18 to 13.5 respectively. These races were not close come election day as Clinton’s electoral votes exceeded 370, far higher than the 270 needed to claim the White House. In 2004, the race was much closer, the electoral tally being 286-251. The VIX went from 16.76 to 12.77. That was a drop of 15% in the election week and over 23% during the two week period. As the VIX crossed 18.50 today, it may appear ready to deflate shortly after the election. Posted in: Uncategorized. Tagged: aapl, analytics, apple, skew, VIX, Volatility, VXX. Either there is a major demand imbalance, or covered or calendar call sellers have overwhelmed call buyers. If you feel that AAPL can breach the 200 day moving average this week, some of these calls may be an attractive value. Last week fortunes were made on the out-of-the-money puts. You have to imagine that short sellers have stops near or just above the 200 sma. Therefore, if this level is breached, the potential for a huge bounce exists.